SeaDek's faux-teak sheets provide unparalled comfort and exceptional traction - even when wet! They have a combined thickness of 6mm of soft, durable foam materials with a simple, robust peel-and-stick backing. Have the look of teak without the difficult installation, costs and maintenance required for real wood. 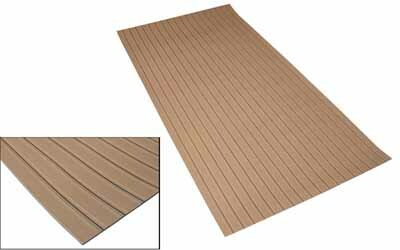 Sheets are 37 inches x 75 inches x 6mm thick, teak brown over black and can easily be cut down to fit nearly any surface on a boat where non-skid, or protection for the boat's surface is required. Select the needed Check box and click buy now of SEADEK 39" X 77" 6MM thick FAUX TEAK.